In 1963, a major engineering feat was completed on the Wairau River, in the Marlborough district: the Wairau diversion. The diversion created two Wairau Rivers, one following its original course, which meanders south-east into a network of lagoons, before reaching Cloudy Bay at Wairau Bar. 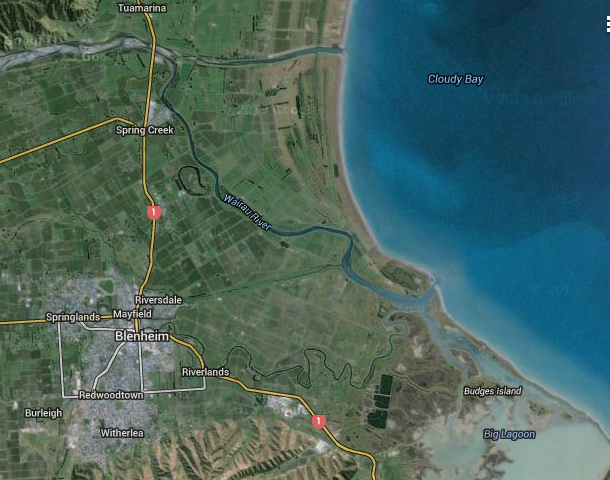 The “new Wairau River” was a channel that connected the river through a cut eastwards to the sea. The purpose of these engineering works, was of course, flood control, something that had created headaches for Europeans from the time they had first settled in Marlborough. It was even the subject of investigation by a special government commission in 1917. But this was not the first time that the Wairau River had been subject to engineering, nor – arguably – was it the most impressive. In fact, this work to alter the natural course of water through the river system had been preceded by about 200 years. The Wairau Bar was one of the first areas in New Zealand settled by Polynesians, in the 13th century. No doubt they were attracted by the tidal estuaries, lagoons, marshes and swamps fed by the Wairau River, rich in food resources all year round. But the Rangitane tribe that settled in the region devised a way to make enhance this food-basket further through a series of engineering works of their own. In the mid to late 1700s, Rangitane dug a system of more than 19 kilometres of canals and channels to link natural waterways for the husbandry and harvesting of fish and birdlife. Their engineering skills were described in 1912 by Otago Museum curator Henry Skinner, drawing on previous surveys and oral histories of kaumatua (elders). He calculated that the 10-12ft wide and 2-3ft deep canals required the excavation of more than 60,000 cubic yards of soil, all dug out with wooden digging sticks called ko, and probably also stone adzes for the harder clays soils. He also described the structures built along the channel for eel weirs and fish traps, and also for trapping the paradise duck, grey duck and other birds that gathered in the lagoons and estuaries to breed and feed. 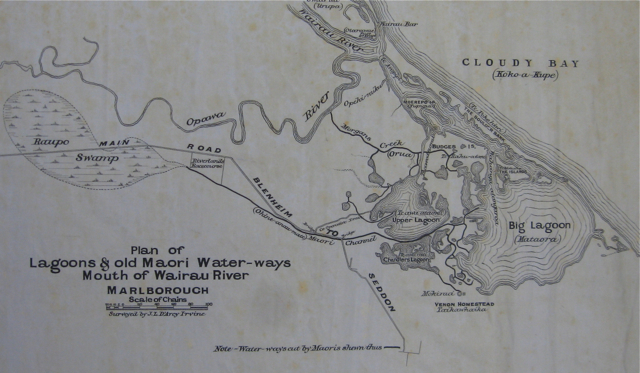 Writing in 1912, Skinner noted that “the clear cut waterways and canals still remain to show Pakeha what engineering skill and enterprise was possessed by the old time Maori.” These canals are shown in the map (top), based on Skinner’s investigations. They are represented by single dark lines and are extensive throughout the lagoon network. I know the Cut well, as the Tarrant Family farmed beside it for many decades before and after it was built. The farm was rich river silt. How intriguing to learn about the earlier engineering works; they perhaps would have been gentler and more beautiful than the rigid lines of the Cut. But it still had a good flow of inanga/whitebait. I can remember eating them! I didn’t realise that connection. It sounds like you may need to be interviewed! That is very interesting and another reminder of how scientifically and technologically clever and capable human beings were even in prehistorical times. Perhaps it could even be said that many were in possession of more wisdom than we practise in the present. The plan of lagoons and channels is incredibly complex it seems to me. And what a great job Henry Skinner did in recording them 100 years ago. I wonder if any sign of them remains.